Have you ever listened to someone speak then been inspired to step up and answer a call to action? 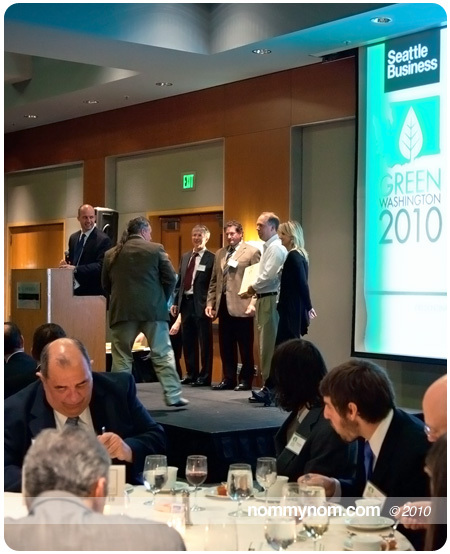 It happened to me this evening at the Green Washington 2010 Awards presented by Seattle Business Magazine. Those familiar with my words know of my passion for supporting local food producers, restaurants, organizations and markets who support local. It is not enough to just be local, but to also have a strong ethical relationship with the environment. I attended the presentation dinner at the Green Washington 2010 Awards by way of invitation from Chris and Lisa Wilcox, the good folks behind locally owned Wilcox Farms. Their organic egg farm had been nominated for an Agriculture award. I am happy that I went (and honored to have been asked) as the event gave me a renewed perspective that solidified my resolve to try harder in my own efforts towards a greener lifestyle. The keynote speaker of the evening was William Ruckelshaus, Co-Chair , Joint Ocean Commission Initiative. Ruckelshaus was the United States Environmental Protection Agency’s first administrator when the agency was formed in 1970. In 1983 President Ronald Reagan re-appointed him as the EPA’s 5th Administrator. He has been in this fight for a better environment since the beginning. Despite his political background Mr Ruckelshaus’ agenda was not about party politics. The speech was not preachy, dry or negative. It was empowering, hopeful and positive. He focused on the progress we have accomplished thus far and the current progress towards cleaning up the environment, since the formation of the EPA. 40 years ago the EPA was in its infancy. It was put together to measure, monitor, and model the environmental future. Educating the public about the importance of preserving Natural Resources and providing legislation that would place the health of a sustainable environment at the forefront. So how did this come about 4 decades ago? Because the people demanded it. There was a need for it, and we were on a path to self destruction. That demand raised awareness, which caused the government to take notice, to step up and take action. Do not listen to the naysayers. Your voice really does matter. “Restoring nature to its natural state is a cause beyond party and beyond factions” quoted from the January 22, 1970 State of the Union Address. That was as true 40 years ago as it is today. This is not about Party Politics or conspiracies. This is about preserving the environment for future generations, while we have the chance. “Green” is not a fad or phase. It is an ongoing, never ending process. It is like a sinkful of dirty dishes, they are not going anywhere and the mess piles up getting worse the longer you neglect it. Soon it smells bad and molds, creating an unhealthy living condition for you. So what do you do? Get in there and do your part to clean up the mess. Do it daily to avoid creating an unhealthy environment for yourself. Our Earth is no different than dirty dishes piling up, someone’s got to get in there and get cleaning. Why not us? Why not now? Why not for the future? In my opinion, tending our environment means making an effort. That effort can be as complex as installing a wind farm for energy or a simple effort such as composting, recycling or simply reusing or repurposing the resources we have at hand. We are the custodians of this planet, no effort is too small. We are still digging out of the hole dug by previous generations, damage that has carried over to present day. So is the EPA and it’s legislation really making a difference? According to Ruckelshaus it is. He stated that our Air & Watersheds are cleaner now than 40 years ago when the EPA first put legislation in place. But we are still a ways off from repairing the damage done by generations past. Seeing a multitude of local businesses who are engaging in greener practices by choice gave me hope for the future. Small business or big business, Democrat or Republican. It did not matter your wealth, social standing or political viewpoint because everyone in that room tonight shared one common and noble goal – the push for a better, cleaner and greener world. Sustainable solutions that are environmentally acceptable, sufficient, reliable and efficient. “Green” is an untapped enterprise that is ripe and ready for the picking. Not only could this be a potential boon for our environmental health, but for our economic health as well. “Green” has the power to take the world in a new direction. Green can create jobs and bolster an economy. It can provide the security of self sustainability. As I looked around the room filled with “Green People” I knew that Ruckelshaus was right on the money with that statement. No one in this room has been sitting idly by. Tonight, it was a pleasure to see those who were being recognized and honored for their efforts. They are the ones who are innovating, practicing, educating and pioneering a path to a greener future for all of us. Their work is inspirational and I am thankful for what they are doing. Let’s not leave them to do this alone. A call to action was issued, and I am passing this call on to my readers. Note: there is no political agenda, biased slants or bogus science involved to be debated here. It is not a discussion about conspiracies, or the fact that you don’t like so-and-so in this or that particular political office, or whether or not global warming is real. It is only about our own role and responsibility as inhabitants of this planet to care for it. The Call is to stand up and make your voice heard for a change and a solution to sustainability. Get involved. Together we can support the people, ideas and businesses who are embracing the movement. We can get behind the technology, greener practices that lower our carbon output and laws put in to place to protect the goal that we have been working towards for nearly half a century. A goal for a cleaner, greener and more sustainable existence. 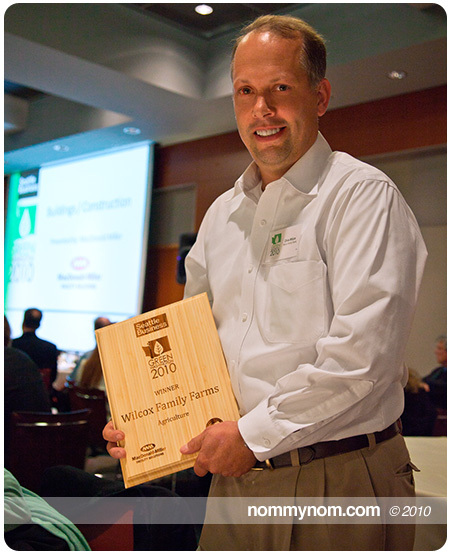 I am happy to report that Wilcox Farms did receive the Green Washington Award in Agriculture. Wilcox practices recycling of things such as water from egg washing to water their crops, as well as repurposing chicken waste to fertilize those crops. They are certainly doing their part. Wilcox Farm has been a family owned business for over 100 years, they support the humane treatment of animals and have pledged to utilize green practices where ever possible. Tonight they were deservedly rewarded for their efforts. Congratulations to ALL the winners and nominees this evening, your efforts will lead us to a change for the better. 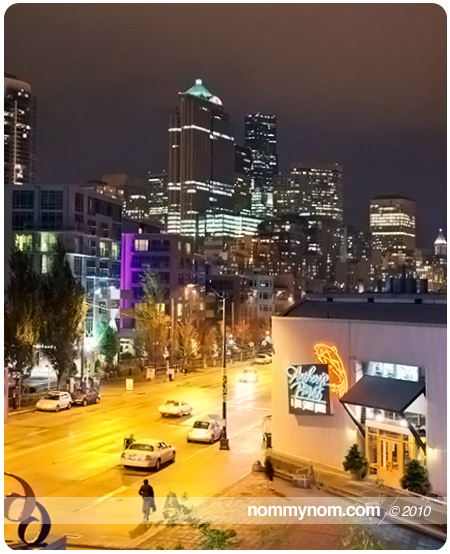 Thank you to Seattle Business Magazine for recognizing the efforts of those who have made the commitment to greener practices. This commentary is nonpartisan and has no political agenda so please refrain from political angst and party bashing. Play nice and keep comments civil and on point. This entry was posted in Events, Out & About and tagged awards ceremony, chris wilcox, conservation, environment, EPA, event, green, green washington awards 2010, issue, lisa wilcox, local, opinion, ruckelshaus, scene, seattle, sustainability, washington, wilcox farms, william d. ruckelshaus. Bookmark the permalink. Thank you so much for documenting and attending this event with us. It was truly a pleasure meeting you. I love gift of homemade vanilla extract (Thank you again). You have so many talents! 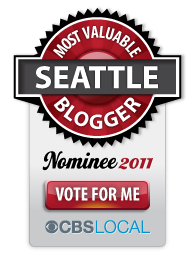 I think your blog story about Keynote speaker Ruckelshaus is very well written. You got all his points and it is true, we all need to stand and make our voice heard!